Photomontage of a boy using a saw to cut into a giant tomato. A man stands beside the boy, watching. A group of giant tomatoes cover the foreground. 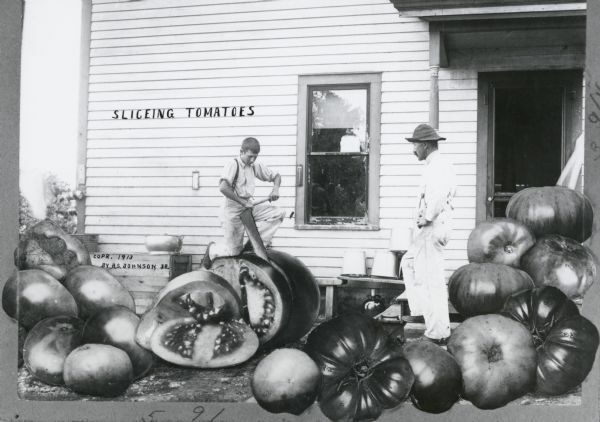 The words, "Sliceing [sic] Tomatoes," are inscribed in the image field on the side of the house in the background. This image would have been cropped to remove the montage elements that bleed over the original's edge and turned into a postcard. Information on back of loaned print: "Wm. and Elmer Vanderkin, father and son. Son lives in same house in County Trunk I. House moved from Chester in 1952 to present location." Waupun catalog no. P62. Made from print loaned by the Waupun Heritage Museum.